The U.S. Geological Survey (USGS) offers on-demand production of Landsat 7 Enhanced Thematic Mapper Plus (ETM+) Surface Reflectance data through EarthExplorer. Surface Reflectance products provide an estimate of the surface spectral reflectance as it would be measured at ground level in the absence of atmospheric scattering or absorption. The Surface Reflectance products are generated at the Earth Resources Observation and Science (EROS) Center at a 30-meter spatial resolution. The EROS Science Processing Architecture (ESPA) on-demand interface corrects satellite images for atmospheric effects to create Level-2 data products. Landsat Ecosystem Disturbance Adaptive Processing System (LEDAPS), a specialized software originally developed through a National Aeronautics and Space Administration (NASA) Making Earth System Data Records for Use in Research Environments (MEaSUREs) grant by NASA Goddard Space Flight Center (GSFC) and the University of Maryland (Masek et al., 2006), applies radiometric calibration and atmospheric correction algorithms to Level-1 Landsat data products. 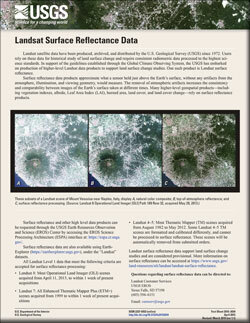 Specific details about Landsat 7 Surface Reflectance can be found in the Landsat 4-7 Surface Reflectance Product Guide. Due to missing auxiliary input data and/or necessary thermal data, Landsat 7 ETM+ scenes processed May 30 through June 12, 2016, cannot be processed to Surface Reflectance. The order status will be updated with this action and the remaining scenes will continue processing. Landsat 7 ETM+ inputs are not gap-filled in the surface reflectance production. Users can refer to the quality assurance (QA) layers for pixel-level condition and validity flags. Select scenes in EarthExplorer using the Order Scene icon on the Results tab. Go to the Item Basket (top toolbar) or View Item Basket (below result list) to review the on-demand order. Click on L7 ETM+ C1 Level-2 to expand the list to view the selected scenes and verify the product type. Select Proceed to Checkout then Submit Order to initiate the processing for Surface Reflectance products through ESPA.